I ran into a 45 minutes traffic jam 3 weeks ago on my way to work that had really no reason being there and it became the impetus of searching for better alternative. After a bit of research on the interweb I settled on trying out the Navigon’s MobileNavigator for iPhone. 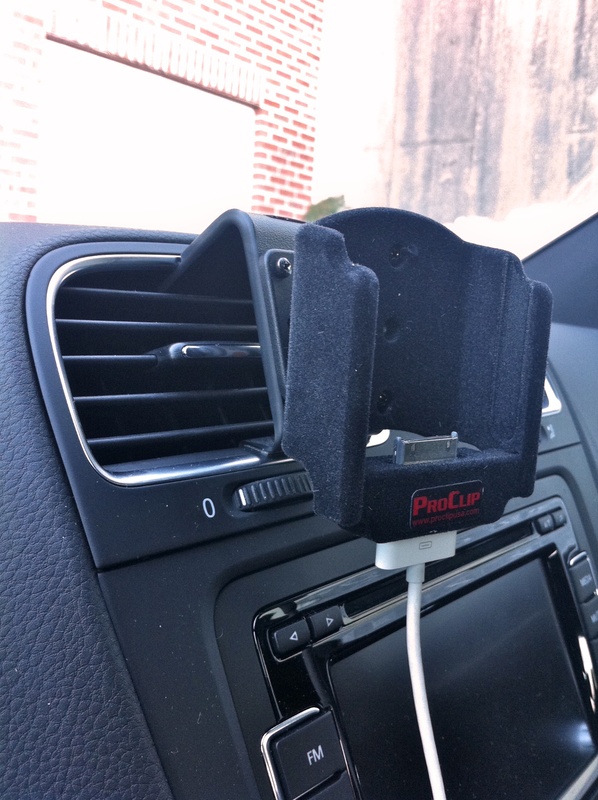 To mount the phone in a suitable location in the car, I opted for ProClip mount which I’ve heard good things about it. 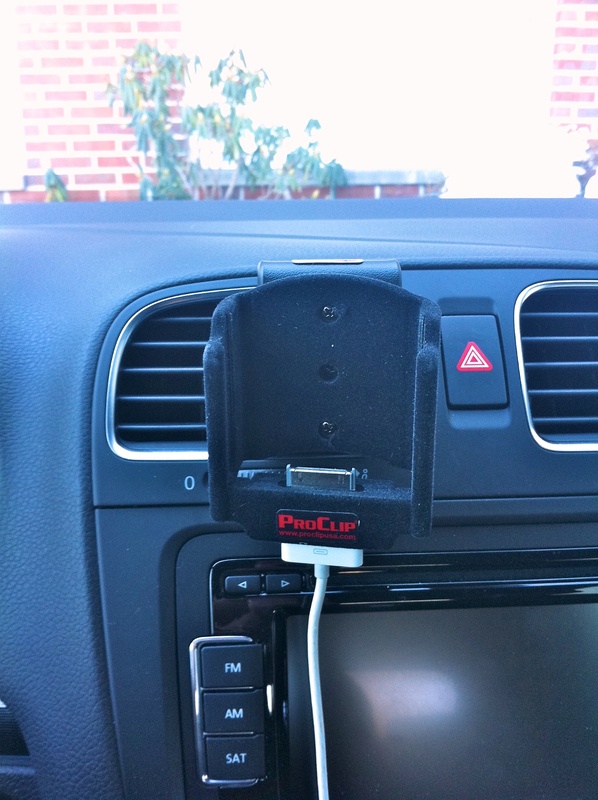 When I first bought the GTI last March, ProClip came up in my internet search for dashboard mounting for iPhone/GPS/etc. but due to the relatively high price I decided to go with the Garmin’s own bean bag mount. But after seeing my friend’s ProClip mount in his truck last summer, I decided to splash out this time and went with ProClip. Despite my apprehension on the cost, it didn’t disappoint. ProClip comes in two parts. First the mounting clip designed for each car model so you have to ensure you pick the correct one during the ordering. The second part is the actual cradle/clip that your phone/GPS sits in and it screws onto the mounting clip via a standard mounting holes. Both parts are made of high quality plastic with the device mount covered in felt to protect your device being scratched. 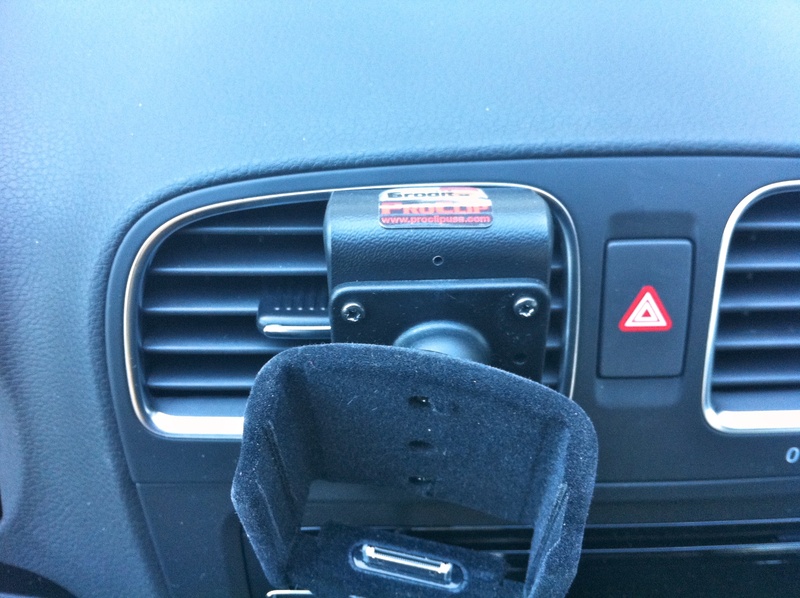 Installing the vehicle mount was a simple process of giving the center air vent a good clean using the alcohol wipe that comes with the package. Then removes the adhesives on top and bottom of the mount, align the top part with the vent hole, and finally push the bottom in till it clicks into place. After that, screw the device mount on, adjust the angle, tighten the swivel mount screw to keep it in place, and that is it! One annoying thing after a week of usage is that the screw that keeps the swivel mount in place keeps loosening by itself. It only gets loose a tightly bit but enough to make the mount less resistant to movement. I hesitate in tightening the screw too much in fear of stripping the thread. May be it has a metal bolt in the back to prevent that but until someone tells me otherwise, I will continue to be careful with it and just deal with the loose screw. A week ago today, my wife and I drive out to Flushing to have lunch with friends and was the first opportunity to test out the Navigon app. In addition to the app I also purchased the Live Traffic module and I set it to automatically use traffic information when calculating routes. Straight away, it directed us to a different route to Manhattan Bridge than the Garmin, completely avoided the busy Sunday Chinatown traffic. It was a little discerning at first as Navigon has not yet gained my trust on its route calculation ability. On the way back from lunch, again it directed us off the BQE briefly then back on it due to slow traffic on the highway. Pretty clever! The downside of this feature is that it relies on other Navigon users to supply the traffic information (as far as I can guess). This means on the route for my commute where there are less Navigon users on those roads, the traffic information is less accurate and thus less useful. Another downside with the Live Traffic feature is that Navigon displays all the icons that show other Navigon users on the route planning screen, thus obscuring the actual route(s)! If you live in an area where there aren’t many Navigon users on the road then it won’t be a problem but living in NYC means there are lots of them and my map pretty much filled with Navigon user icons! The 3D map is better than the Garmin due to iPhone 4’s Retina display. But more importantly, it has the ability to customize what POI (Point of Interest) to show on the map. It comes with everything switch on so I immediately turned them all off except for gas stations and parkings. I also like the multiple turns hint on the Navigon. Whereas the Garmin will only display hint for only one upcoming turn and shows the next one straight after the first if they are in short distance from each other, the Navigon knows that and shows the first turn in the big window in the bottom left corner and stack a small window on top with the direction for the turn straight after! The Active Land assistance is definitely helpful, especially when a realistic road sign is displayed on screen. This will eliminate (or reduce drastically) the uncertainty when driving in unfamiliar roads since road signs in the US on a permanent diet. Having said that, the integrated audio control is nicely done. When the audio control button is tapped, the map page curls up (just like in iPhone’s Map app) and shows the audio control like the iPod. You can add songs/podcasts/etc. 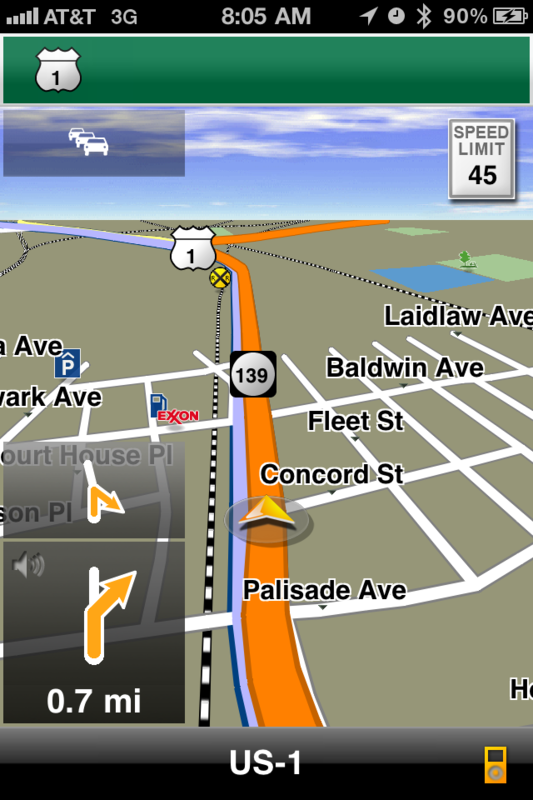 to the Navigon’s playlist and then the map page curl back down automatically. So with one week of commuting under my belt, I’d give the Navigon MobileNavigator app a 4 out of 5 stars. If it can accept routes from Google Maps, and fixes some of the annoyances in future updates then I’ll give it 5 stars. As for the ProClip, 4 stars as well due to the forever loosening screw for the swivel mount. I tend to get anxious when I’m driving somewhere unfamiliar (not great, I know), but I feel much more comfortable knowing there is a device that knows where I’m going. Does the app stay on or does the phone go to sleep as usual? The phone stays on while the app is running.